KawaiiPunk - Kawaii Mascot Blog: Labyrinth Logic! Minotaur Mascot! Hmmm, very interesting! 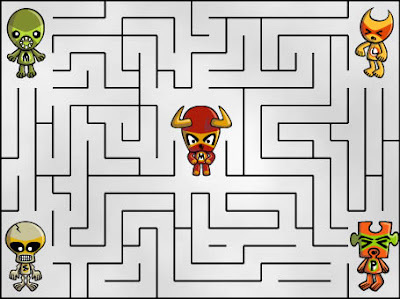 It looks as if the Minotaur Mascot had some help in escaping from his supposedly eternal bindings. Well, you didn’t expect someone with the head of a bull to work it all out by themselves did you :) The question is… which mascot was it that master minded the Minotaur’s escape from the labyrinth? Was it Monster, Lucky 7, Skull, or was it… me? The answer, as ever, will be revealed in this month’s monthly round-up!